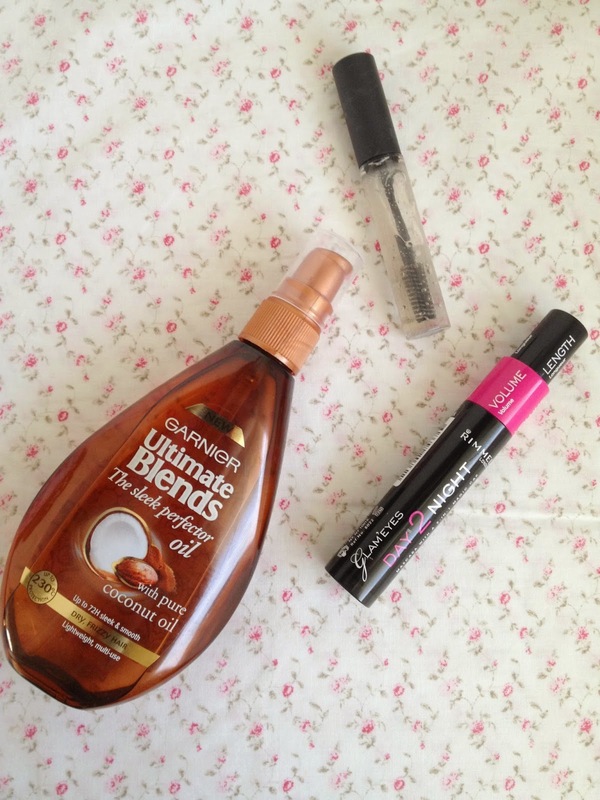 Just Taylor: August 2014 favourites! Hi guys! Throughout the month of August there have been a couple of things that I have been loving, so naturally I thought I would share them with you all! 1. Garnier Ultimate Blends 'The sleek perfecter oil'. As my hair is so long, the ends of my hair tended to get incredibly dry and would break so easily. So when the YouTuber velvetgh0st started mentioning this little beauty in her videos, I definitely thought it was worth a try. This oil is designed to make your hair feeling soft and healthy again, and generally give the ends of your hair as much life as the rest. Let me tell you, it certainly does that. The product contains coconut oil which helps nourish your hair, and it smells amazing too. I normally just add 2 pumps of this into my hands, rub them together and apply it evenly onto the bottoms of wet hair. 2. MAC clear brow set. I had heard a lot of different people talking about different brow sets and how well they have worked for them. However, I don't like my brows to be too dark to I didn't like the idea of a tinted one. This brow set is clear so it doesn't alter the shade of your brows at all, but it certainly keeps them in place all day. I just run the brush through my brows once or twice when I have finished filling them in and they stay in place all day. 3. Rimmel Glam eyes Day 2 Night mascara. Essentially, this mascara is intended to be a 2 in 1 wonder. One bit has a section for volume, and one has a section for length. However, the only difference is how much mascara is on the wand. I dislike the volume side as there is too much product on the wand, and ends up just clumping my lashes together and ruining them. However, the lengthening side has a stopper when you pull the wand out which limits how much product is on the wand. I love the length side, it does exactly what it is titled to do and makes my lashes look amazing. This month I have been really getting into wearing simplistic outfits and then adding a statement necklace to jazz the outfit up. These are two of my favourites. The first is from Matalan and cost £6. This might be small, but it adds a lot to a simple outfit and looks stunning. The little spikes have rose gold/pink glitter in them and shine in the light, and inbetween are little gold feathers. The second is from Primark and cost £3. This necklace is possibly my favourite out of all of my necklaces as it is sturdy and definitely adds a lot of character to an outfit. 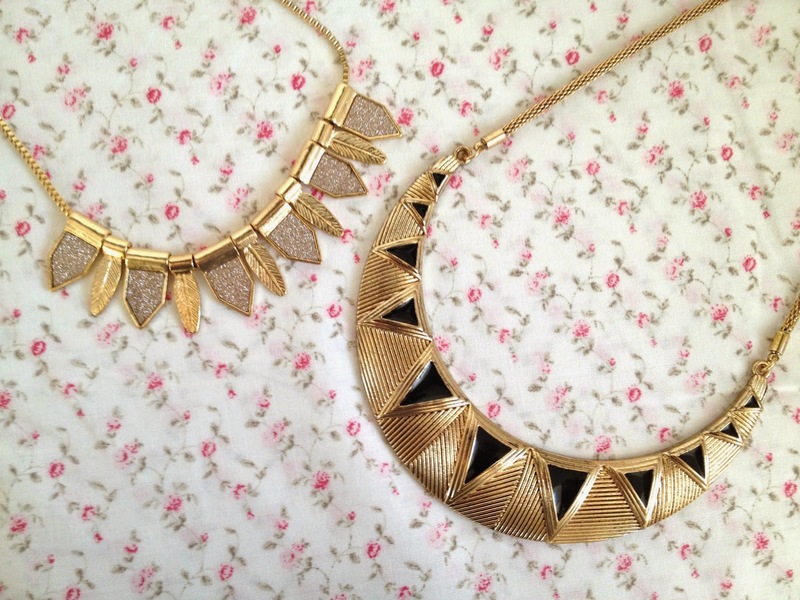 The black triangles around the necklace add a edge to a simple outfit and you can't go wrong in terms of the price.